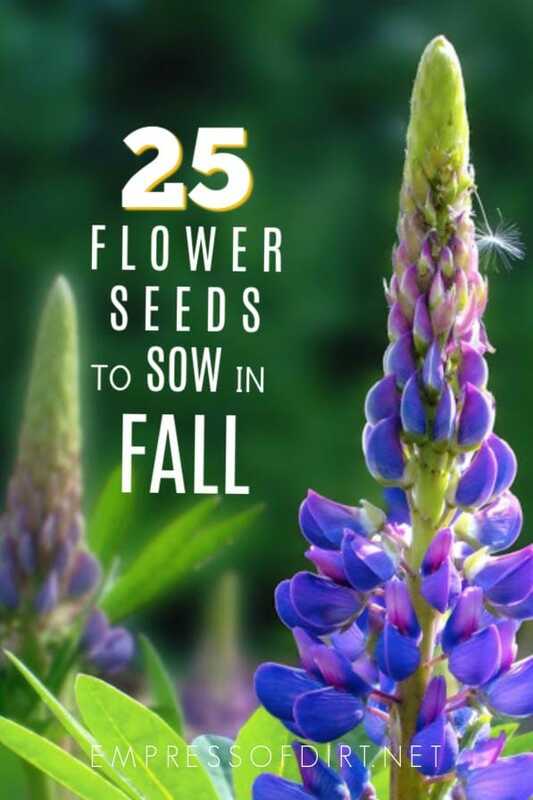 If you live in a cold climate, there are plenty of annual and perennial flower seeds you can sow in the fall garden. Later, as winter turns to spring, the seeds germinate and new growth begins. It is a simple way to start new plants. 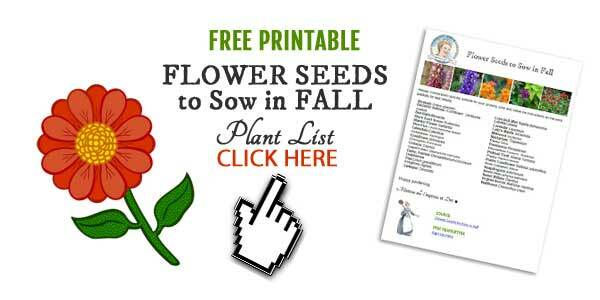 I have provided a printable list for you to choose seeds for your garden. For more, hop over to the Fall Gardening & Winter Prep Headquarters for lots of smart & helpful tips. There is no one-plant-suits-all in gardening. With each growing zone and climate, there are plants that thrive, and others that do not, either because they are too tender or aggressive. Tender plants (when we attempt to grow them as perennials) demand too of our time and resources to help them along, and the aggressive ones invade, hogging natural resources. The first step is to know your gardening zone (for plant hardiness) and learn which plants are best for your growing conditions and climate. Invasive species (plants and animals) are huge problem these days and it is critical that gardeners are making safe choices that benefit the environment. Growing zones are usually displayed on plant packages, tags, and seed packets to assist your buying decisions. To learn more about local conservation authorities and endangered and invasive species, see Handy Online Resources for Gardeners. There are so many plants gardeners later deeply regret planting. Learn from their mistakes by doing your homework before planting or sowing. Never assume because a plant is sold at a local garden nursery that it is harmless to the environment. Plenty of invasive species are sold every day. Fall in love! Once you know what is safe and beneficial to plant, explore your options, look over your neighbour’s garden—the one with awesome beauty!— and choose what you love. 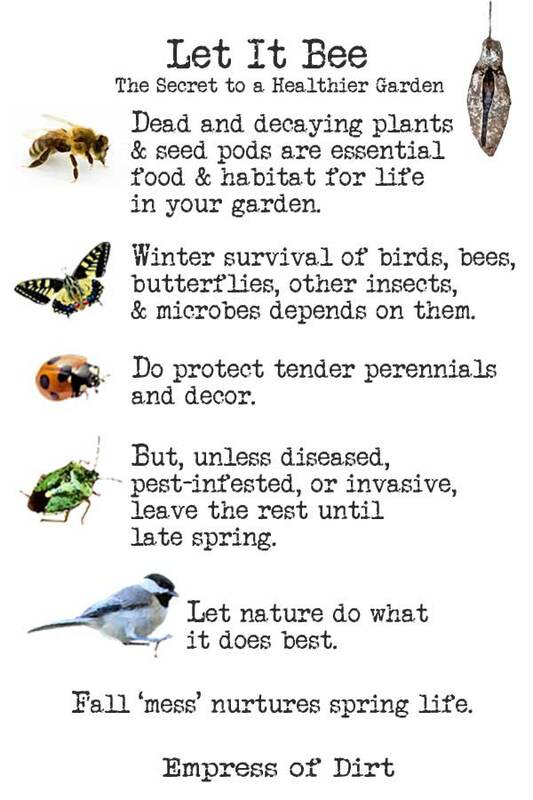 For me, I love having a lot of wild things in my garden—insects, birds, bees, mammals, pollinators, things pollinators eat, and so on. The whole circle of life. So, I focus on the plants that attract, feed, and house them, in a cottage-style design (aka dishevelled, densely-planted garden, with lots of colour, texture, and variety). Got a patio or balcony? You can sow seeds in containers just as you would in the ground, using good potting mix. When first frost is imminent, add some straw, burlap or other insulation on the surface of the soil to prevent the seeds from freezing or store the container in a cold (not below zero) garage until late early spring. 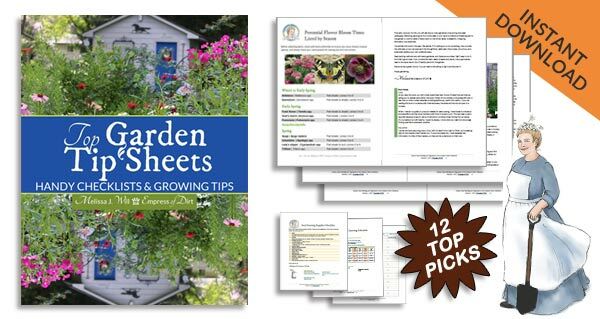 25 Flower Seeds to Sow in the Fall lists annual and perennial seeds you can sow in fall, before the ground freezes, for spring and summer germination and (best of all) flowers! You can see examples of the recommended seeds here on Amazon.com. I do, however, always recommend finding a local seed seller if you can. This way you know the seeds will succeed in your climate and growing conditions. There are annuals and perennials, depending on where you live. In Canada and the United States, what’s perennial in the south can be too tender for the north! And, some of our northern favourites, can’t handle the southern heat. Some of the plants on the list, like delphiniums, which originate in a mountain climate, benefit from a cold winter respite, which assists the spring germination process. 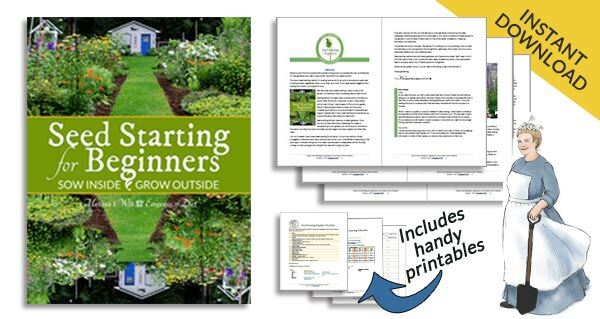 There are a lot of helpful gardening printables available here on Empress of Dirt. I format them to minimize ink use, should you choose to print them out. If you do, keep them in a folder or binder with other gardening notes so you have everything in one handy location. If you are a digital saver, create a computer folder for Gardening Tips and stash everything there for easy reference later. When you click on the button, this printable will be added to your cart. Don’t worry, it is free, and you can download it instantly. 1. Click the ADD TO CART button. If you also want some Empress of Dirt ebooks, you can get them here. 2. Click CHECKOUT in the cart. 5. Download your files. Note where on your device they are saved. 6. You will receive a followup email confirming your download links and a message from me. Choose seeds suited to your growing zone and conditions, making sure none are invasive species in your area. Read your seed packets for best timing for seed sowing, and provide the best soil and growing conditions possible. If there are special instructions on the seed packet, follow them! Some seeds with tougher shells benefit from scarification (scratching the surface before sowing) or pre-soaking for better germination rates. Mark where you sow with winter-durable tags or markers. It is incredibly easy to mistake freshly germinating seeds for unwanted weeds, or stomp on tiny seedlings in the spring garden. Mark your spots! When I need a permanent plant ID tag, this is the plant labelling system I like. Want reliable plant information? These are my go-to plant databases for identifying plants, growing tips, invasive species news, and more. This method of fall seed sowing is really just an imitation of what nature does at the end of the summer growing season. Flowers turn to seed, seeds fall to the ground, and some germinate. In a cold climate with a true winter, germination is simply delayed until the warm weather returns. Want to plant flowering bulbs? This lists 20 flower bulbs you can sow in fall. And fall and spring are best for these cool-loving greens: 20 quick-growing veggies for your garden. Late Season Seed Sowing | When is it too late to sow seeds? My question is about invasive plants, especially bush honeysuckle which is doing it’s best to take over the state of Missouri. I like to feed the birds, but they bring in seed of the honeysuckle which then proceeds to take over. Is there a way to stop it that is safe (not a herbicide)? I have been out of commission for 3 years and unable to cut it. I also cannot afford to hire someone to cut it. Will natural weed killers like salt, vinegar work? It spreads by seed, runners. Hi Dorlis, It’s a great question. I cannot think of a way that does not cause addtional harm. While we call things like salt and vinegar ‘natural’ weed killers, they really are not. Too much salt is very harmful for our soil and waterways. Vinegar is an acid that kills everything in its midst. And, random seeds deposited by birds would be nearly impossible to treat without overtreating an entire garden. It sounds like regular manual weeding is the best preventation. Also, a good layer of mulch (2-inches deep) will definintely stop or slow self-sowing seeds. I know, not the answer you were looking for, but far better than the alternatives. Thank you for posting this , new to sowing for the next year very excited ! Great information , can’t wait to see what grows ! Make sure your seeds are organic. I found the hard way that most nurseries, big box stores have plants full of toxins meant to kill insects feeding on them. Now I only buy organic seeds and plants so I DO NOT KILL OFF THE VERY CREATURES i am trying to help. Yes, organically-grown are a great choice. Thank you Melissa and have a great weekend.